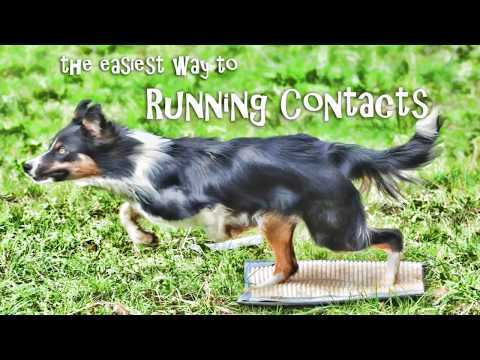 It covers both dog-walk and A-frame and is appropriate for total beginners, retrains and all trying to improve their running contacts. The DVD is 1 hour long, plays everywhere in the world and can be shipped anywhere. Shipping is the same regardless of where we are sending and how many DVDs you’re ordering. OR, you can decide for the download version, save on shipping and have it on your computer in less than an hour after ordering. We recommend playing it with VLC or QuickTime player. I will start to train AF now with Hero and i would like to have running AF. Do you think i should try to get two strides or is this to optimistic and i should from beginning train one stride only? I wouldn’t worry about number of strides and just select for good running style… If you can get good reach and separation, we can get the hits as well, regardless of number of strides. You gave up on DW? Sure, sounds like a good plan! Hi Silvia, could you possibly have a look and see what I’m doing wrong please? 🙂 We started running contacts last winter but gave up as we weren’t making progress, started again at the beginning of this winter….not had as much chance to work on it as I’d like as it’s been so wet here! 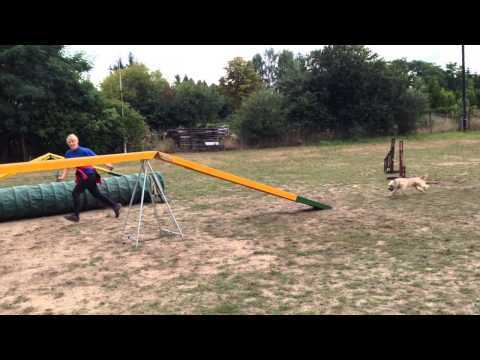 We were getting over 80% success with low dogwalk (65cm?) and one particular start spot, went up to medium trestles (80cm?) as have nothing in between, and all of a sudden Dazzle is trying to take a stride out and do it in 4 strides! 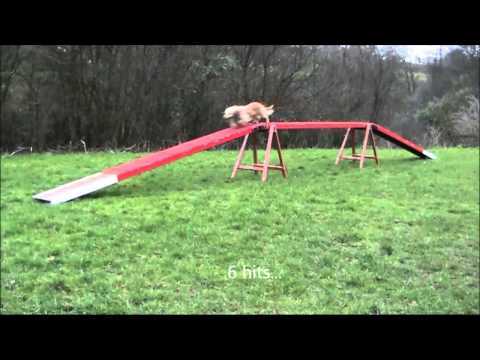 She’s still running, still showing separation, so missing not leaping, although if she put her front feet down I think she’d be there……..in 5 strides (6 hits) she’s there, but these are rare, mostly getting 4 strides/5 hits and a miss! I tried increasing the approach speed to see if she could get there in 4 strides, but she’s not big enough! Should we lower the height again? Find a start spot that gives us consistent 5 strides? Play the get that contact game? Very grateful for any feedback, as I’m tearing my hair out!! Most dogs avoid hitting with ff once the height goes up, so we don’t want those no -- just limit her speed on the approach to get 5 stride rf hits. More height will discourage 4 strides anyway. Some gtcg never hurts either. Thanks Silvia! One more question….is it OK to carry on competing with our 2 on 2 off while we’re training running, so I don’t put us under pressure to try and train this too quick? Yes. You just need 2 different cues of course. Great, we have 2 cues! One more question, last one I promise! Is it best to work on getting to full height before we do proofing like different start spots and approach speeds, or better to do all that at this height and then go up again and do it all again? Very grateful for your help, I have something positive to work with now, after getting varying advise from elsewhere and getting confused (which is why we gave up last year!)! No, only add speedier approaches when close to full height as more height will discourage 4 strides. Hi Silvia, this is where we are at. I have been starting him from a sit in front of the DW to get some low-speed approaches as you said. We are at 100cm now. Is this ok? This is good for hits yes, but throw in some speedier approaches and try to get 4 stride hits now, before raising it any further, as 4 strides is more realistic striding for him as 5. We just finished Running Contacts December class and now we are trying to manage running contacts by ourselves. But we ran out of ideas. We have tried to change the starting spot and my ball trowing but her success rate is still very low. I guess she is leaping sometimes? Here is the video of her last three sessions. Right now we are doing 2-3 sessions per week, should we do more? 3 sessions on full DW. April. Looks like good running to me… Are you starting from a wrap? Maybe try starting from a stay, maybe her striding will be more predictable then and good starting spot easier to find? I have some trouble working out what kind of set up I like/am able to have. This one we both enjoy, even though I would rather be able to use a lowered DW and increase height. Is this set up OK? Will be get brilliant RC working like this? If so -- do I only bring her up higher on the DW when the angle is more like the real DW? Low DW would be better if possible… This can work as well, but transition to full DW will of course be harder as when you can work with full low DW. Hi Silvia’ I wanna know your advice about the running of Zelo. Does he run airy? Looks ready for plank work to me! It could be even flatter, but certainly not really airy. Last time i had problem with focus ahead. It is better now I think. Now we have another problem. She changes the rhythm and tries to make third part of DW in one stride, so she is very high or before zone. We have also problems with game on the end of dw. I am waiting for opening rc class very much. That’s a typical PyrShep problem yes -- too long stride for 5 strides, too short for 4. This is what I get with Le if I train on short DWs, so I only train on 4m DW and then she does 5 strides in trials out of habit. Le’s sister has the same problem and no longer DW, so she uses carpet extension to make it look longer. Another thing that helps is to work on advanced exits as that promotes a bit less speed on a down ramp as well, so I would focus on that now. I don’t really think she needs gtcg as she is clearly trying to hit when doing the whole DW, she just needs to figure out her striding. Thank you for the quick reply. I’ll train according to your advice.